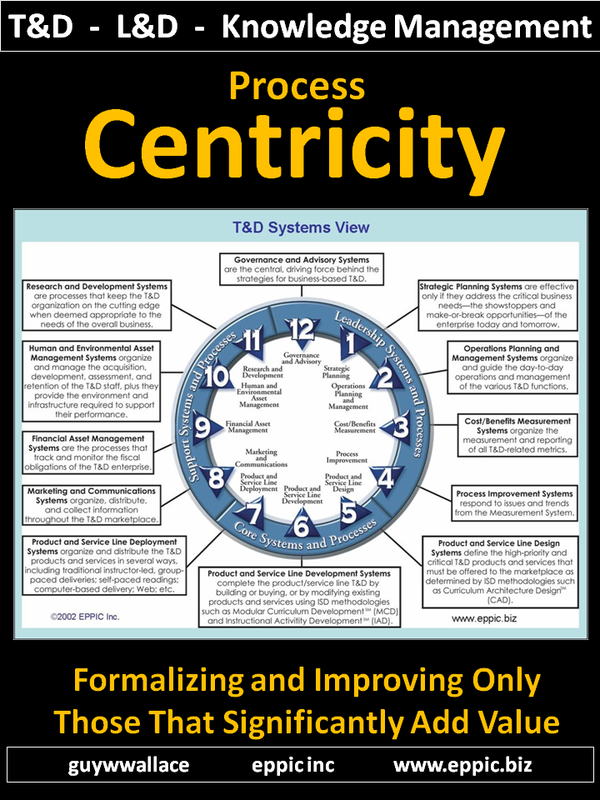 When I developed my ISD methods – the PACT Processes for T&D/ Learning / Knowledge Management – I did so knowing that later I would extend them into Performance Improvement. 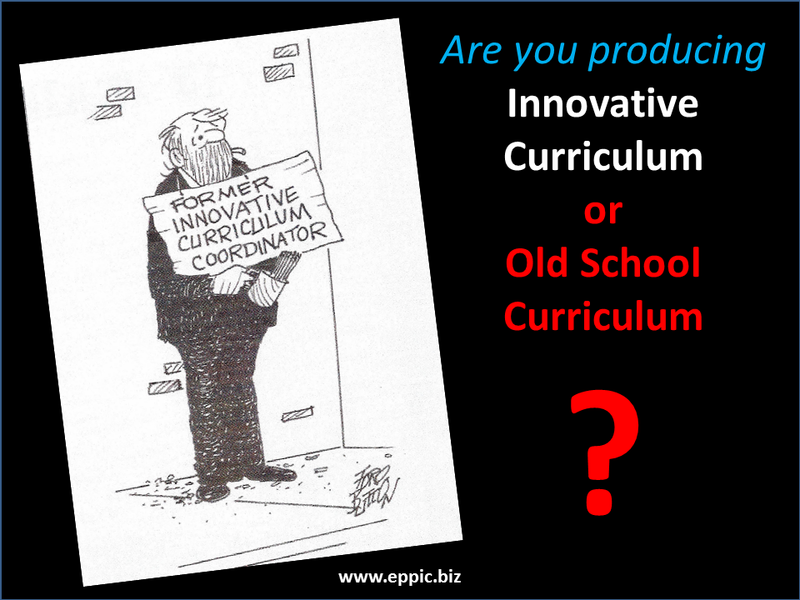 Both would focus on “Processes” as the focus of leverage – not on tasks for performance of the individual. And at the higher level of organization. The traditional framework of individual, process and organization is sometimes referred to today as the worker, the work and the workplace. Another unique aspect of my approach is a view of the Stakeholder – including but beyond the customer – in the mix. 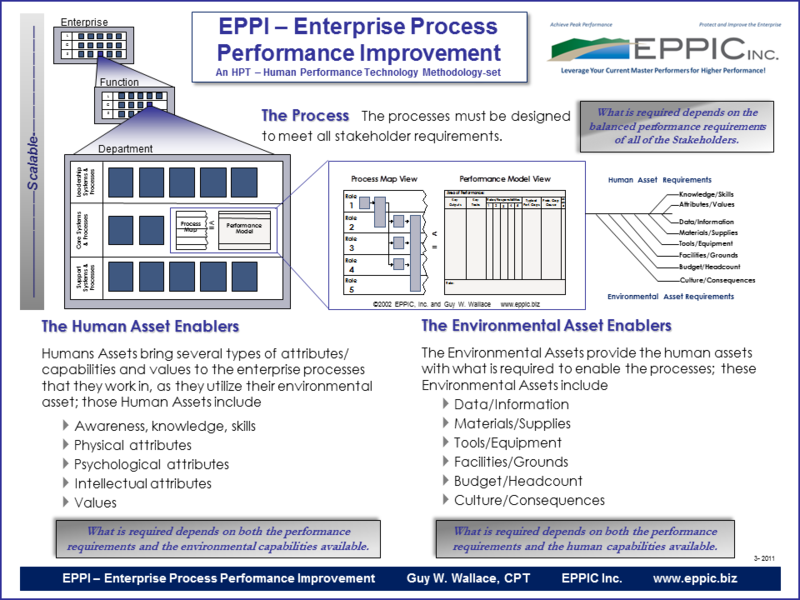 Here is my Big Picture of EPPI – Enterprise Process Performance Improvement. 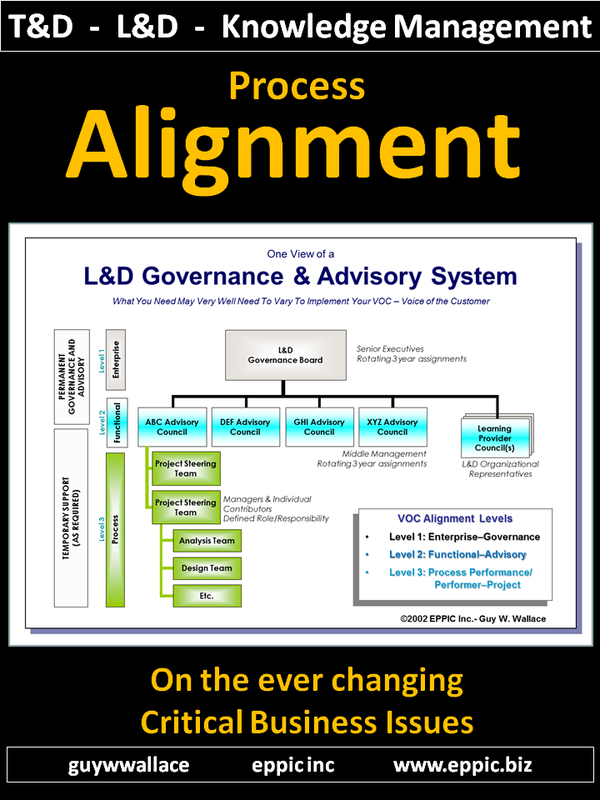 I use “the department” as my typical frame of reference – and that could be the function, a collection of departments – or a team, a sub-set of a department. 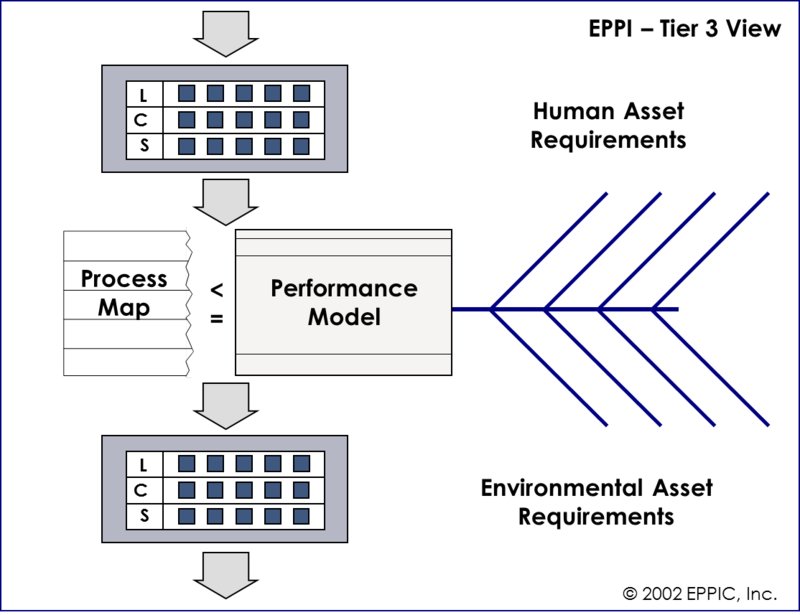 The purpose of that is to easily determine the shared Processes versus the unique Processes of one, any and all departments. Some Processes are shared, such as Strategic Planning, Budgeting and Hiring – while others Processes, those that differentiate one department from another, are unique such as various Sales Processes in the sales department, Payroll Processes in Payroll, etc. My goals were to always find shareable Processes – so as to share content whether that content be training, policies, procedures, etc. That’s just good stewardship. Those Process, shared and unique could then be used to systematically derive the enablers and any deficit in those enablers could be traced/tracked back to those organizational entities, again departments, that were supposed to “provision” those to the target department – to see why they were falling short in delivering the right stuff, at the right quantities, at the right qualities, at the right time, at the right cost, etc. Those “shortfalls” were the causes of less than ideal performance of the target Process or Processes of the target Department. 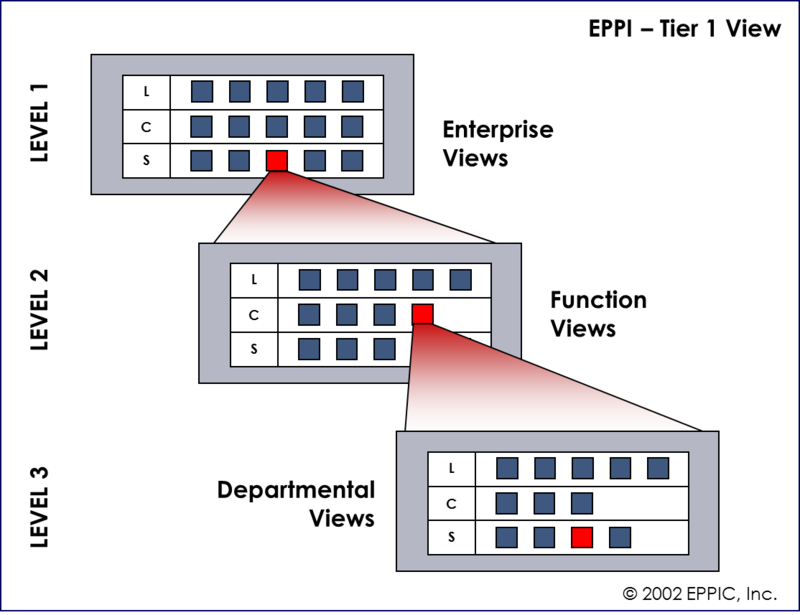 Then you go and apply the same logic, the same thinking on those upstream Processes of the upstream supplier Departments – so that you might square them away, so to speak. All Departments exist in a Tree like structure. 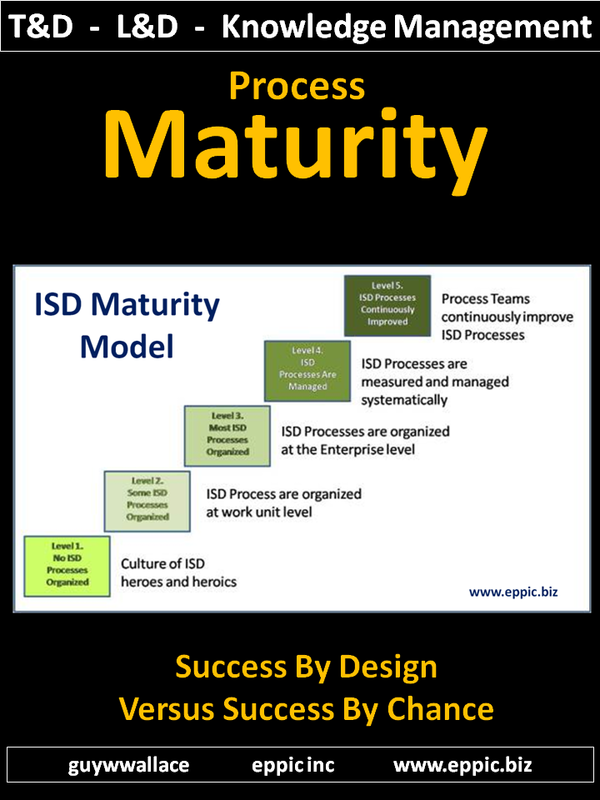 I know that the quality movement of the past 30-40 years encouraged organizations to reorganized around Processes versus their typical Functional orientation. 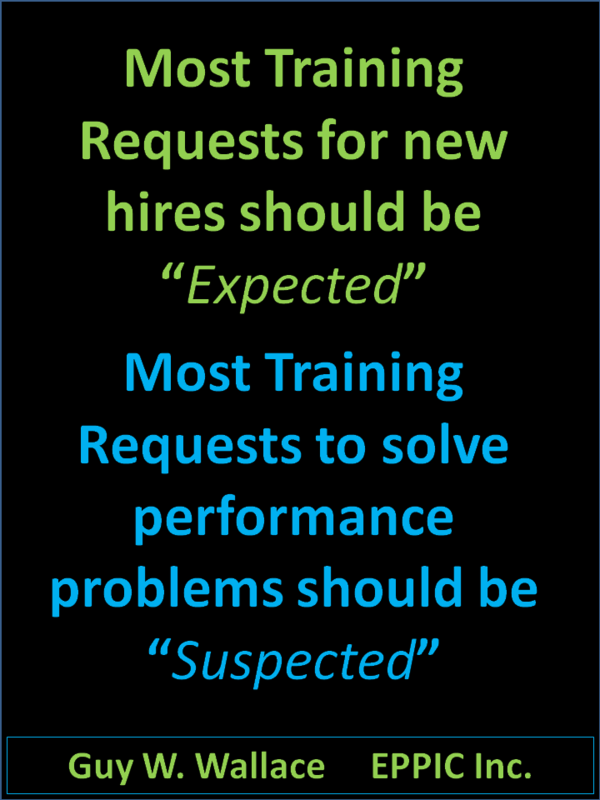 But most of my clients didn’t do that – so I need a way to view them in their Functional state – and help them be Functionally-oriented but Process-centric. Think of a fairly simple organization that is composed of function which are composed of departments. Expand the complexity as needed. The model is scalable. 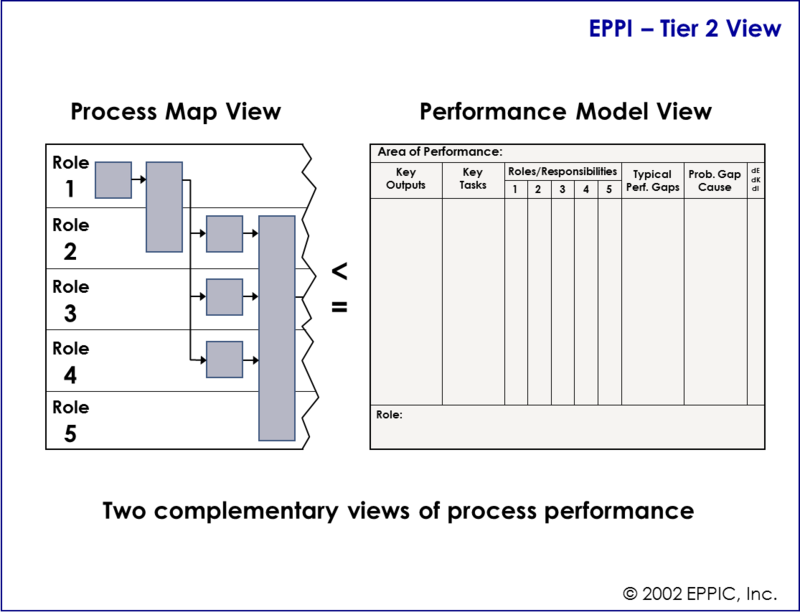 Then use whatever methods/device you prefer to map or model the Process or Processes – whichever gives you the greatest level of detail for defining the ideal state – and enables a gap analysis about the real, current state. 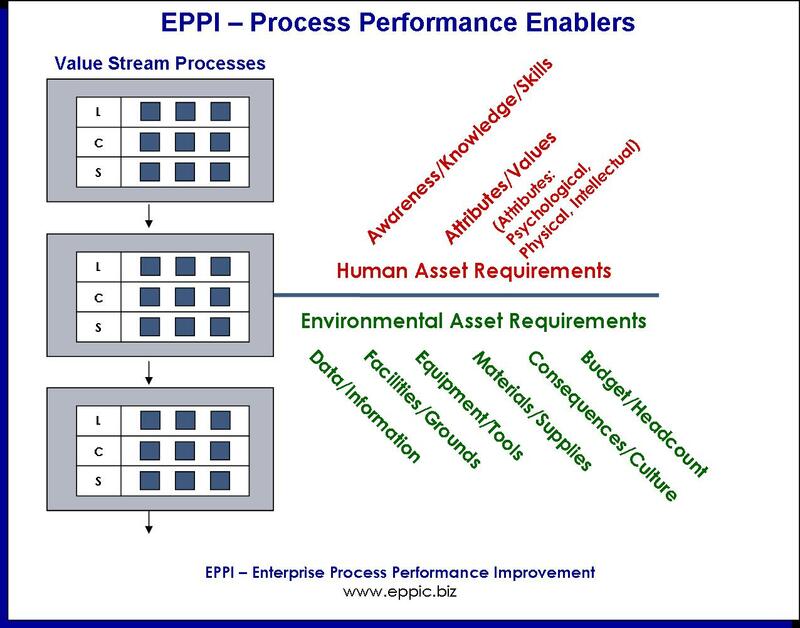 Then use those articulations of the Process or Processes to systematically derive the enablers. What brings a “paper process” to life? In my model and methods it’s people and non-people things. See that first graphic again, and click on it to enlarge if needed. 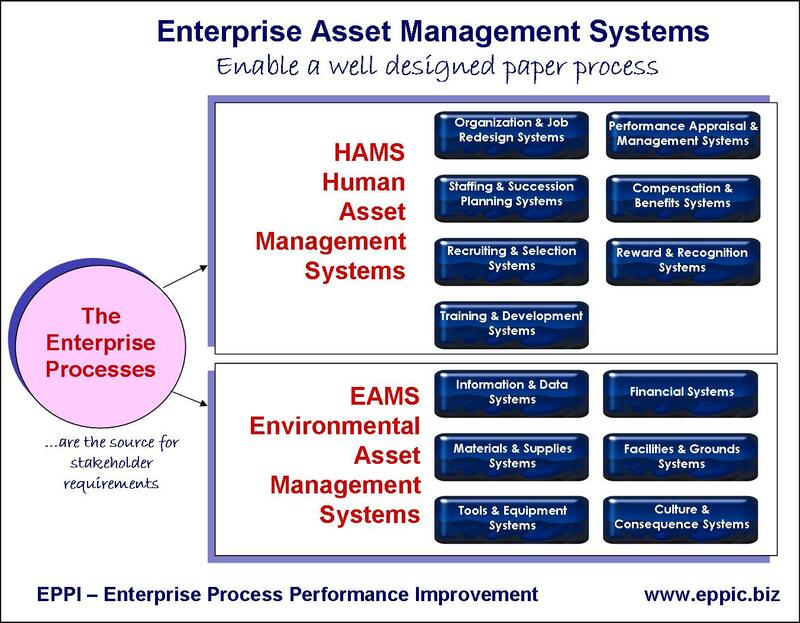 There are Human Assets and Environmental Assets that bring a paper process to life. Something not up to snuff as they say may be the cause of a problem or lead to an opportunity. I start with the Process – as one of my mentors, the late Geary Rummler used to say: Put a good performer in a bad system and the system wins every time. 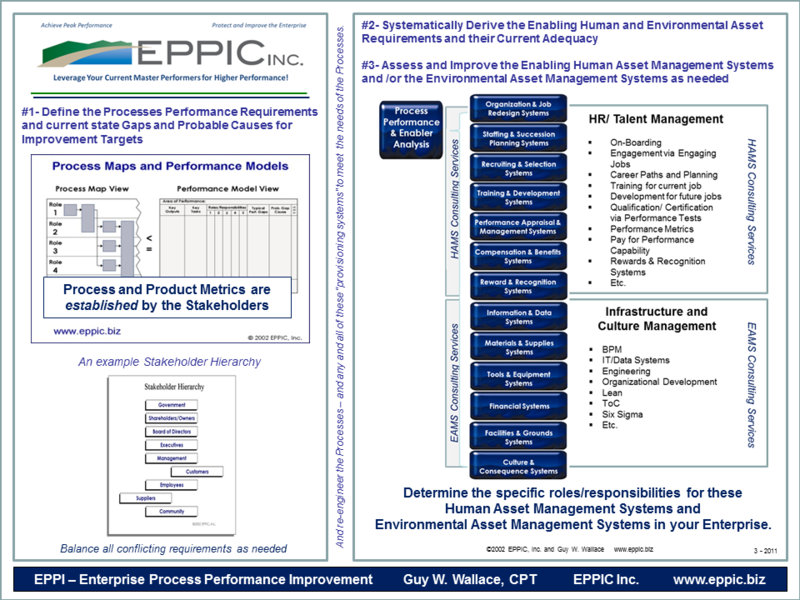 Replace System with Process (Geary was a Process-kind-of-guy) and perhaps this will make some sense. Here is my “straw-dog model” of a Department – used to determine the naming conventions and formality – or informality – of the Processes that are shared and unique. 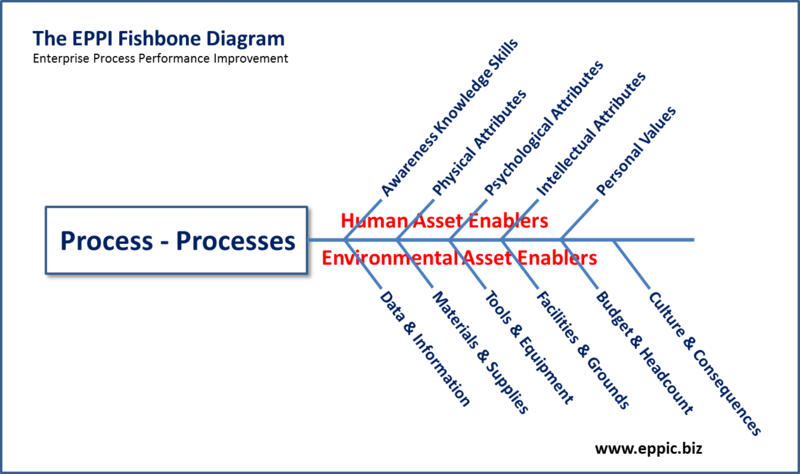 Here is a graphical representation of the enablers – in a Ishikawa Diagram-like form. That’s where the model came from – an extension of that model. 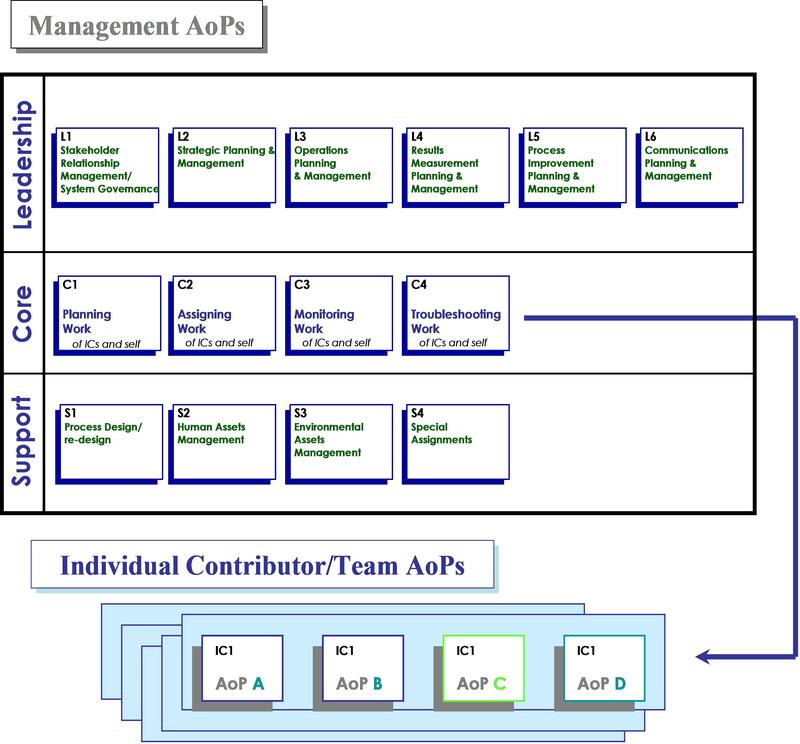 The names of the organizational entities that support Processes differs one organization to the next – but this model is used to determine “who is doing this kind of work” here – and what are they called? Is there more than one? 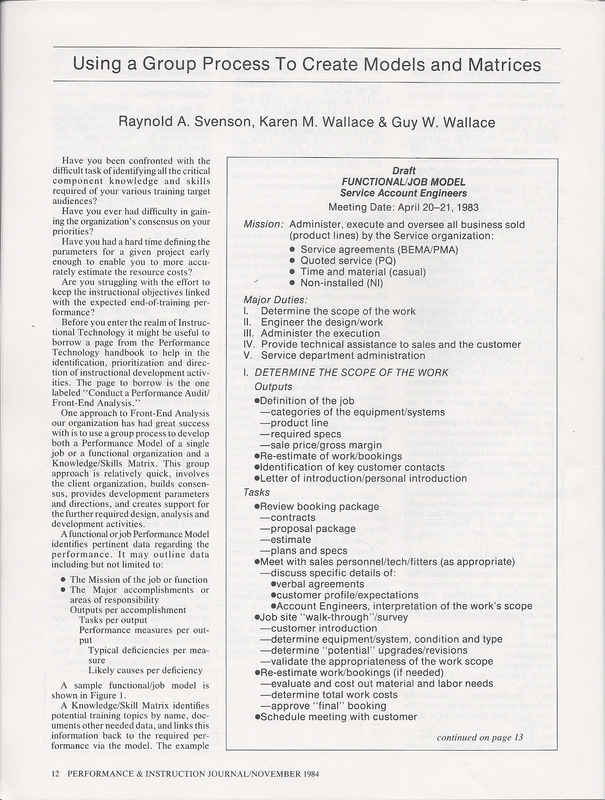 The analysis that supports this was covered in the NSPI (ISPI now) Performance and Instruction Journal back in November 1984. And more recently in 2006 in the Handbook of HPT – in chapter 11. 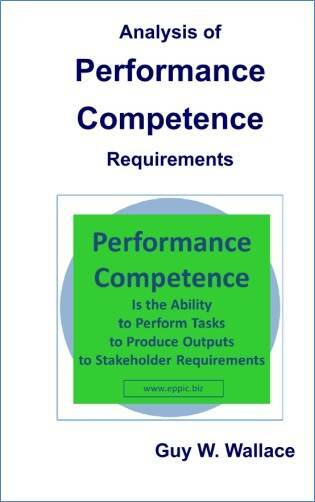 And most recently in my new 2011 book: Analysis of Performance Competence Requirements. 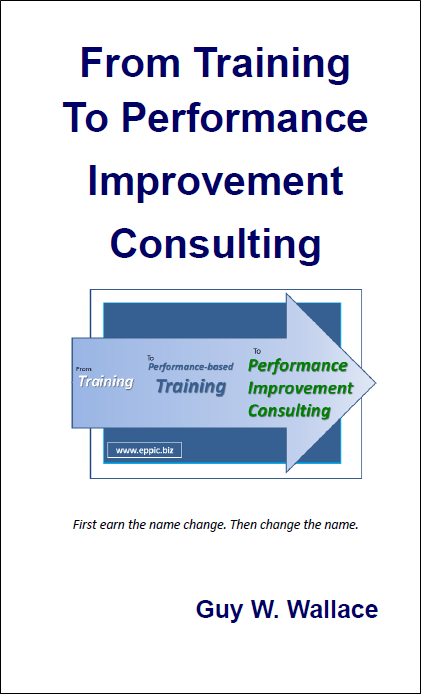 It is also a part of this new 2011 book: From Training to Performance Improvement Consulting – which covers both the analysis as well as the processes for Instruction and Process Performance Improvement. The new books are available as paperbacks – and soon as Kindle ebooks – see more about them here. I also offer workshops for my client’s staff development needs in these analysis methods – and in Instructional Design methods. See about those here. 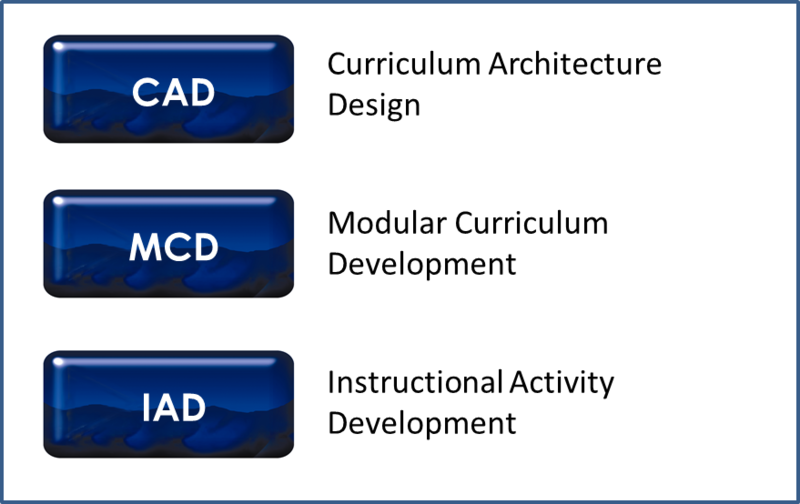 And I do consulting engagements in ISD efforts – where my specialty is in Curriculum Architecture Design efforts to produce Training & Development/ Learning Paths. I’ve done 74 since 1982 – and have trained hundreds of practitioners on my own staff and the staffs of my clients to build their capabilities and capacities. See more about that here.